"PLUG and GO or PLUG and STAY"
What is Kinetic Motion Option? A fully loaded semi (80,000 lbs) going 70 mph has about 17,000 horsepower available in kinetic energy. 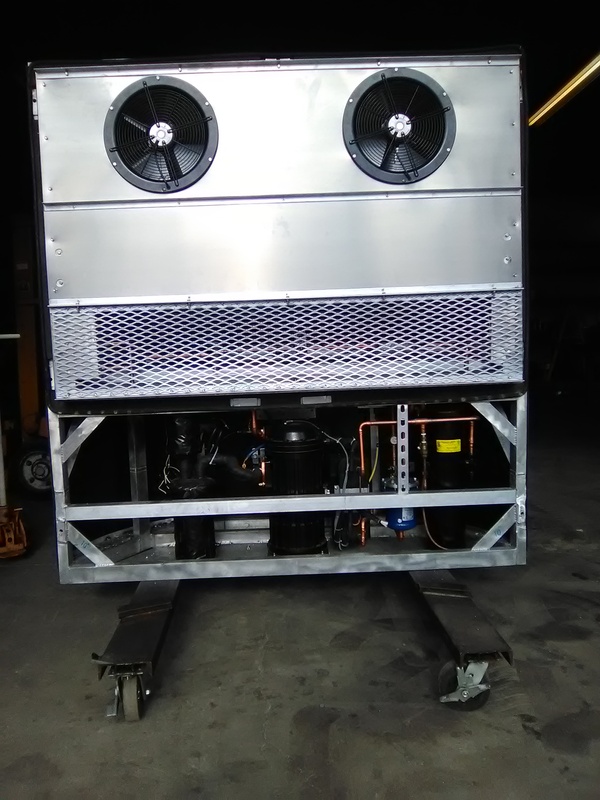 What we at ElectraCold have done is to harness a small part of the available energy by using highly efficient hydraulic pumps (up to 98% efficiency) and use that energy source to power an on-board 18 kW 220/440 volt ac generator. 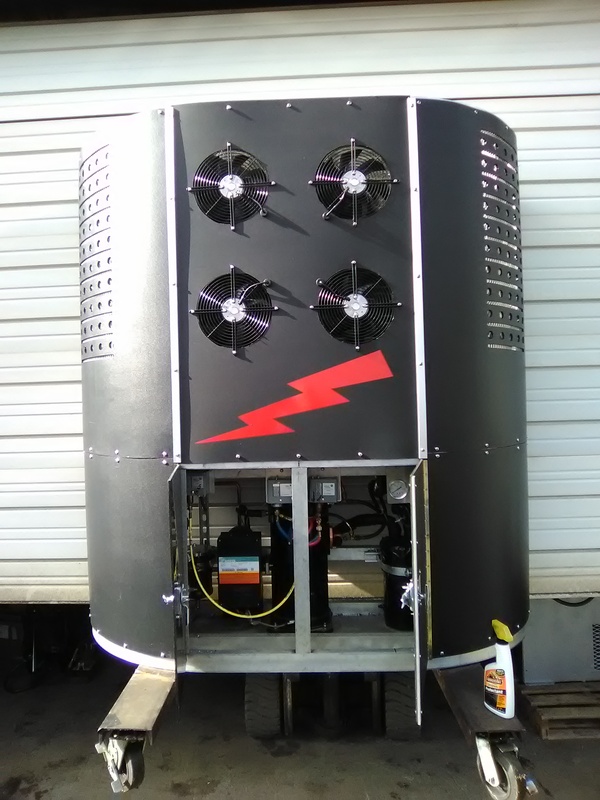 This electrical power is sufficient to power even the largest electric trailer refrigeration units (TRUs) available. It actually has the power to run two units at a time. The system uses two hydraulic pumps; one on the tractor engine and one on the drive train of the tractor. At speeds below 40 mph the tractor engine supplies all the necessary power to drive the generator. At speeds above 40 mph, 95% of the time, the drive train uses the kinetic energy from the moving vehicle to supply the power to drive the generator. All this at up to 98% efficiency. There is no other system that can provide a more cost effective means of providing refrigeration to the trucking industry or a cleaner energy system to meet the demands of today and well into the future. DO YOU TAKE YOUR HOME'S REFRIGERATOR IN FOR A REGULAR CHECK-UP OR MAINTENANCE? WHY DO YOU HAVE TO DO THAT FOR YOUR TRU? Electric TRUs eliminate exhaust emissions. Electric TRUs are not subject to CARB regulations. Electric TRUs reduce weight up to 1,500 lbs. over diesel units. Electric TRUs have improved reliability & durability. 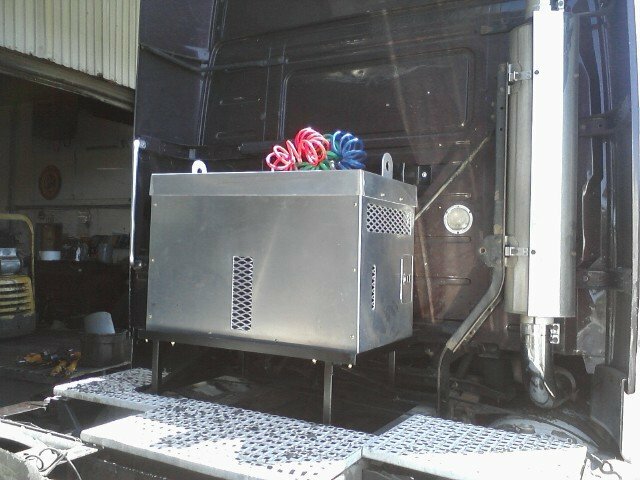 15kW generator mounted behind the truck cab and under the swing of the TRU. Left view shown with covering removed. By using the on-board electric generator with an electric TRU, you will be contributing to a considerable environmental savings in carbon emissions. The main tractor engine will emit much less carbon than a smaller industrial engine running at high speed in existing diesel driven TRUs. The maximum required power from the tractor engine will be just 30 horsepower (normal operating load will be about 17hp). Under normal full load highway speeds, the tractor engine will consume about .20 (1/5 gal) gph more than normal, if the TRU is operating. At idle, the tractor engine will consume about .25 (1/4 gal) of a gallon per hour more, if the TRU is running. The result of the added horsepower load at idle increases the stack temperature which in turn reduces the emissions. Overall, the result is a savings of about 1 to 1.25 gallons per hour depending on operating conditions. Using the Kinetic Drive option will reduce the total fuel consumption to about .1 (one tenth) of a gallon per hour for a normal trip where the truck is traveling over 40 mph 95% of the time. Now, take the money saved with an electric TRU and put it back in the profit column. That is a savings of over $1,000,000.00 per year. There is much "debunking" of the idea of fuel savings due to the fact that it "takes x amount of fuel for each horsepower" and, that by taking it from the nose mounted diesel engine, it would only transfer it to the tractor engine. That is not true. What is being referred to is direct engine to horsepower calculations. 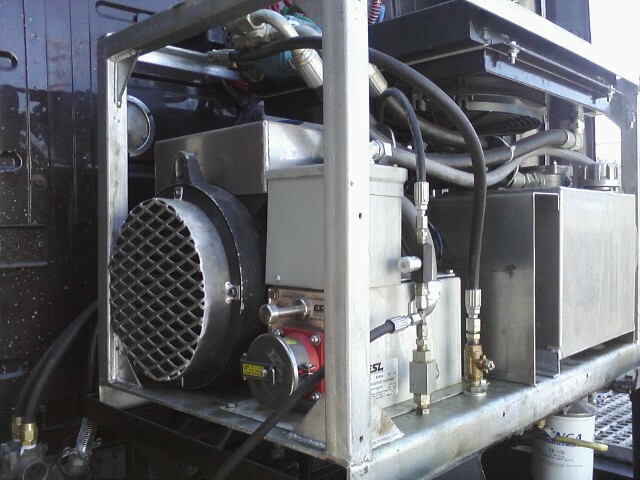 The electric truck transport refrigeration units are powered by a hydraulically driven 15 kW generator powered from the drive train of the tractor engine. This type of power is called "parasitic" horsepower and is not calculated the same as direct. Please read the CAT and DATA attachments below for further information. As a side note to the above information, this method of powering refrigeration equipment is not something new. We have been supplying this type of refrigeration equipment to the fishing industry for over 40 years. 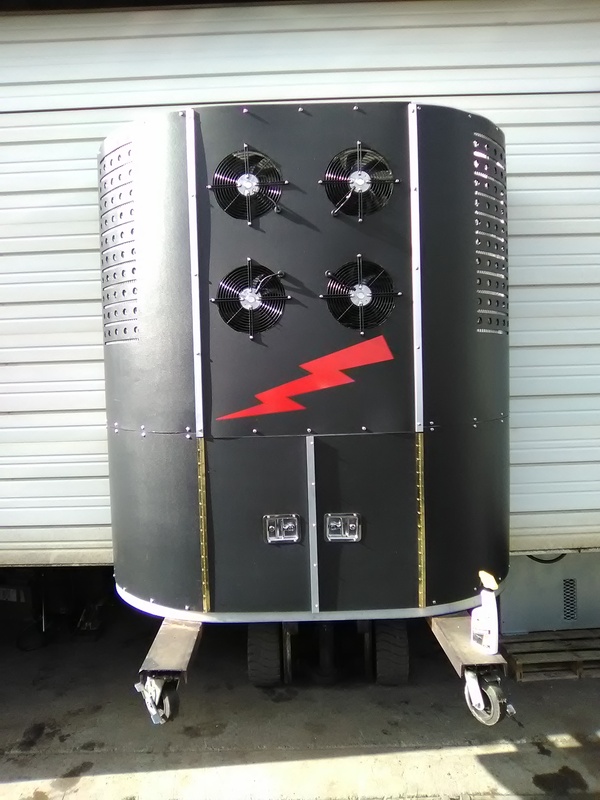 ElectraCold, LLC is in need of additional funding to finish Phase 2 which is the testing and final development of the manufacturing prototype. Even though the product is valued at $10M, the evaluation for the $200K required to finish Phase 2 is set at $2M which will provide a 10% interest in the company. ElectraCold, LLC will change from an LLC to a C Corporation with stock authorized and issued to owners. Phase 3 evaluation will probably be at least $5M, but will be set by the Board of Directors. Only the 10% ownership offered at this time will be accepted. Any offers for more than 10% will be given first priority, if any additional funding is required. Further details available below under "Investor Information". Copy and paste email address for best results.